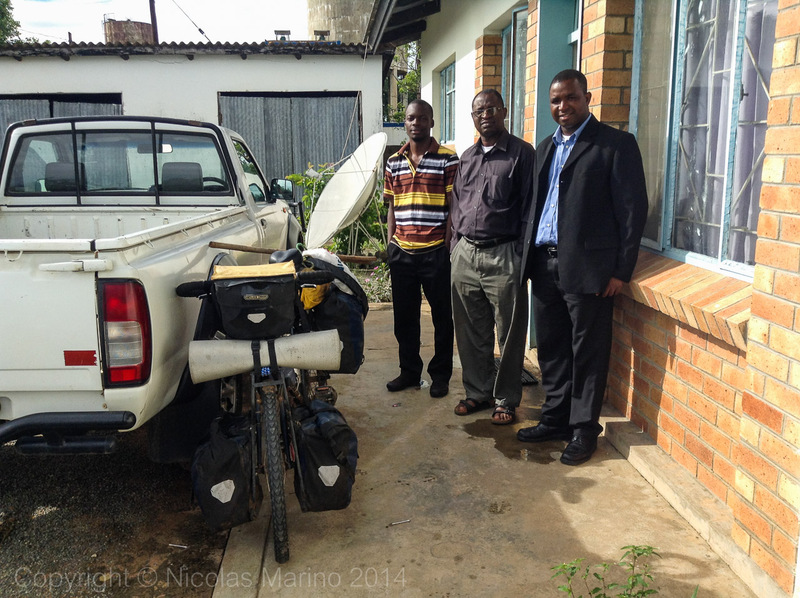 It is a long and a very boring journey from Malawi’s border to the capital city of Zambia. The landscape becomes monotonous and there is really nothing more to see other than flat bush all around us. The difficulty of the road is non-existent, zero, zilch. However, you could easily say that an extremely boring road becomes as difficult as one of very steep slopes, because it is not easy to kill the time on a borring one where there is no challenge of any kind. Luckily, Zambians are exceptional people. Here in Zambia you can already perceive the first qualitative change of the arrival to southern Africa. In a short time, it became very obvious the greater educational level of the people (regardless of their wealth), something that would become constant throughout all the countries until Cape Town. The major evidence is the definite end of the ever present echo of : "mzungu, give me money!!" The first impression is that humble people are kind, and even though – like in most of Africa - a white person is by his color, presumed rich ; here, whites are not pursued as people who just came to give money away, nor we are pointed at or yelled at in every corner. Here we feel accepted as equals more or less, and that is a priceless feeling after so many months in which people would once and again highlight the differences, always under the African prejudice, that ALL whites are unimaginably rich. In every village I stop, I perceive people’s joy, even like a sort of pride because I had decided to stop there, to visit them, to talk to them and spend some time. Communication is not a barrier anymore because Zambians had been a British colony and they speak very good English. 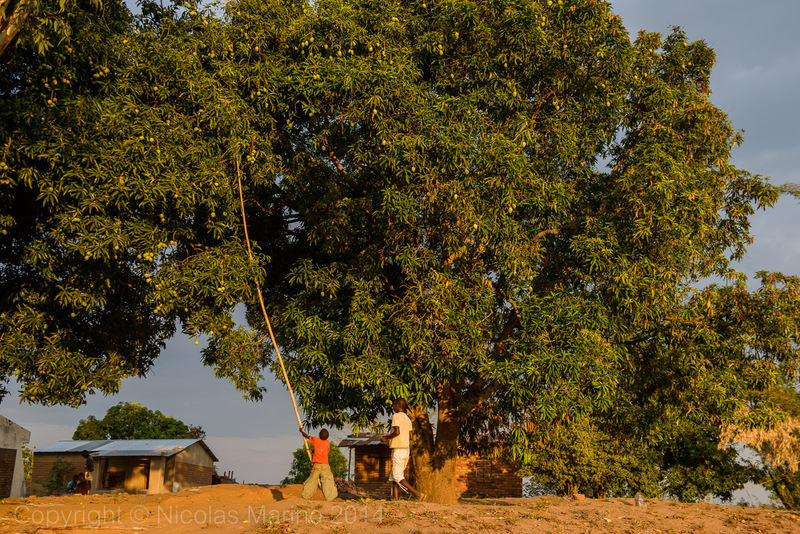 Weeks ago when we were riding across Westwern Tanzania, one tree appeared in our way, one enormous tree that would become our dream tree and companion all along our way through Africa: the mango. At that time though, we regretted passing by these endless rows of mango trees that were full but still very green to eat; we couldn’t believe our bad luck. Nonetheless, what we didn’t know then was that further south, many more trees with ripe mangos would be waiting for us. 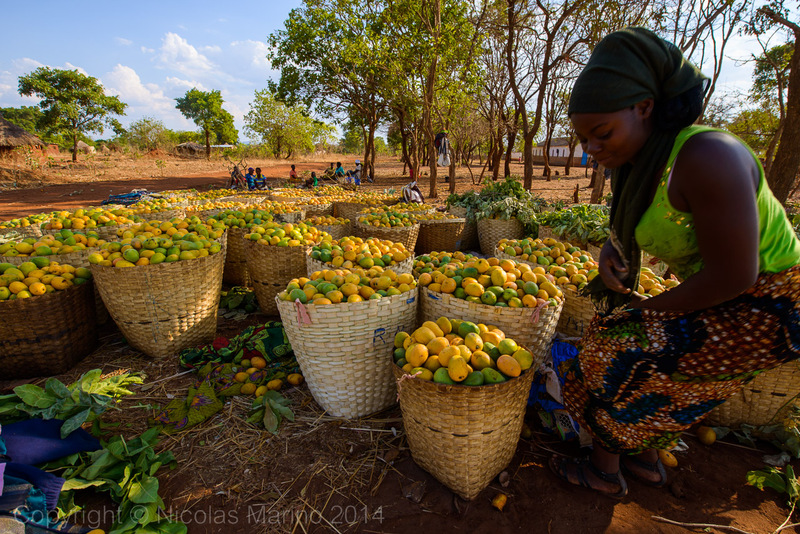 Suddenly, in Malawi, mangoes were all over and became our elixir from everyday life. They were part of our daily diet as they are for the local people as well. In every village you could see children and adults with long bamboo sticks to take them down from the trees and sell them afterwards for cents on the roadsides. 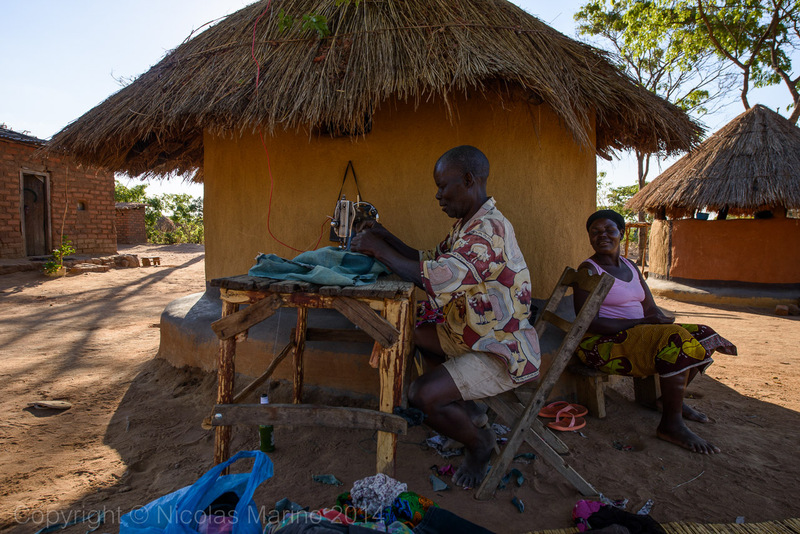 By the time we arrived to Zambia, the mango trees exploded, there were more mangoes than stones on the ground, and as I have mentioned in this blog before some time, there are many different ways in which we may think of paradise. For me, a place surrounded by mangoes is heaven on earth and that's what we fed on for the rest of the way, overdoses of sweet mangoes. Sometimes we do not understand why we do certain things or why certain certain things happen to us in our life, at least not always at the very moment they are happening; sometimes we need to wait for days, weeks, months or even years to fully understand the situation and understand ourselves, and on the way, being punished with the denial to find the oportunity for redemption. We arrived to Lusaka after very difficult weeks as a team, and right then, Josefina decided to go back to Europe… but Julia too… In that precise moment my whole world, literally fell apart and nothing would ever be the same again. Here, I’m sorry to cut you short on the details of the story, because this blog is not some corny latin american soap opera, and those details will remain within the boundaries of my/our personal life, but that is how, one day, the union that I believed indestructible, crumbled as a castle of cards blown by a gentle breeze. This is how I ended up alone once again, only five days before Christmas, preparing myself to celebrate the saddest holidays I can remember in my 36 years of life. 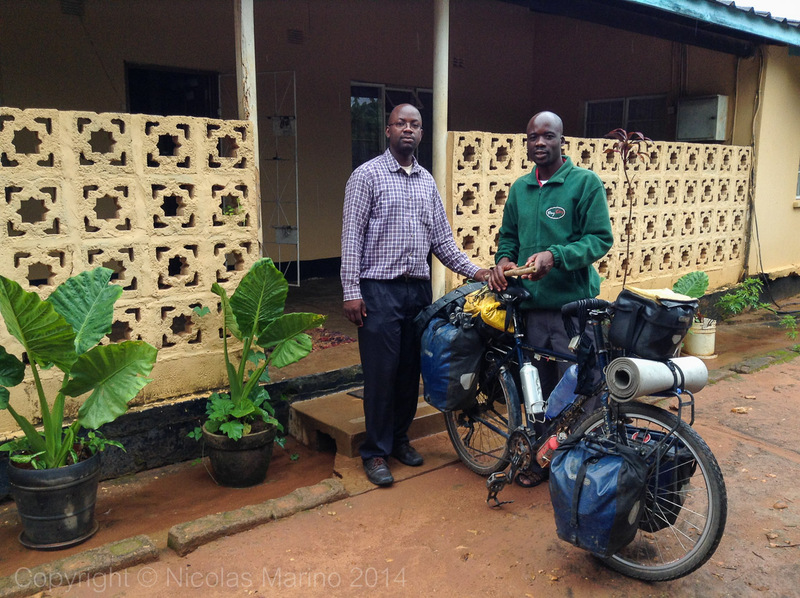 I had no consolation the day I left Lusaka, my agony was so suffocating that it was only by inertia that I was able to continue pedaling and leave town. I was trapped in a neurosis of pain, remorse, guilt, alienation and the most horrible anxieties, I could barely move while leaving a river of tears along my way. I knew that during the coming nights, that hole in my chest that was as big as the size of my bike's wheels would not allow me to sleep, so I decided to exhaust myself physically let the exhaustion subdue me at night. However, nothing seemed to be enough. The first day, I did 160 km in 7 hours (I usually do a 100 km in 6 hours) but my body is so incredibly strong after so many "battles" along the roads of this world, that Zambia does not even have the roads necessary to exhaust it. At the end of the day I arrived at the village's church and looked for the Father to ask him for a place to sleep. Sebastian, an adorable Zambian priest, came out of the room to greet me with a beautiful welcoming smile. I tried to pull off my best possible smile in return, but soon after I begin to explain why I was there , Sebastian stops me cold, as if he had not been truly listening to me, and says "Nico, you are very sad!" ........ He left me speechless and I tried found the words to explain what was wrong trying not to break. He touches my heart when with the affection of a brother tells me: "come here, you can stay with us all you want! and holds my shoulder with care. The next morning I need to get back on the road so that the anguish cannot consume me. There's something about the endorphines that while does not cure me, at least helps to mitigate the unbearable emptiness I feel. Before leaving, Father Sebastian calls the Father of the town 150 km away where I'm planning to spend that night, at the church of the same diocese. He goes: - Father Emmanuel, please, receive Nico, a cyclist who will arrive this afternoon there- 6 hours and 150 km later, I still don’t feel the slightest fatigue. I knock on the door of Father Emmanuel, who was waiting for me in his free day with a room ready for me. In a conversation while he watching a football match in his living room, he tells me: "Nico, something happens to you .... Are you all right?" I wonder what Zambians priests have in order to be able to read the hear of people they don't know so well. 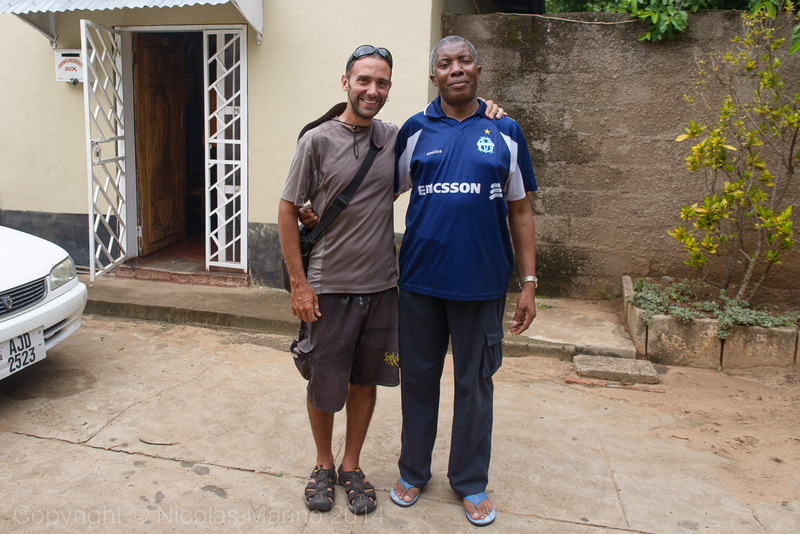 The next morning, Father Emmanuel said good-bye to me and calls Father Cletus from the next village 170 km away. He goes: - "Father Cletus, I'm with a friendly bicycle traveler who needs a place to stay there tonight, could you give him one?". At the end of the day my legs still don’t feel tired; Father Cletus invites me for tea and shows me the room at his home. He is one of the most intelligent and educated people I've met in a long time, Father Cletus speaks to me of his work to raise the level of education of local people and interrupts himself to say “but Nico, you're not OK ... " . DAMN IT ! (I thought to myself) Now, I'm going to look at myself in the mirror to see whether there is something written on my forehead, or these priests are clairvoyants or I look so pitiful that I'm way too obvious. Before I leave, he tells me to go see Father John in Livingstone for tonight. Finally, I get to Livingstone one day before Christmas, 490 km and I have done it in three days and a few hours; I begin to believe that this sadness could make me win the Tour de France if I would race it right now, and I guess using sorrow as the fuel of the engine would test negative in the anti – doping test. In the church of Livingstone, just 8 km away from the famous Victoria Falls, Father John (a friend of Father Cletus) welcomes me. Maybe it is because of the emotional moment I am going through and/or because I arrive alone at Christmas time, but John was one of the most special and above all, human persons, I have met on this trip, a real life lesson. Father John becomes my great and only friend during the 3 days I stay with him, alone in the church’s residence. On Christmas Eve, I decide to go to mass, it was unfortunately hosted by the archbishop and not by John, but still, it was nice, because Christian spirituality with African blood has a much more beautiful and positive energy than the one in the West (in my perception). 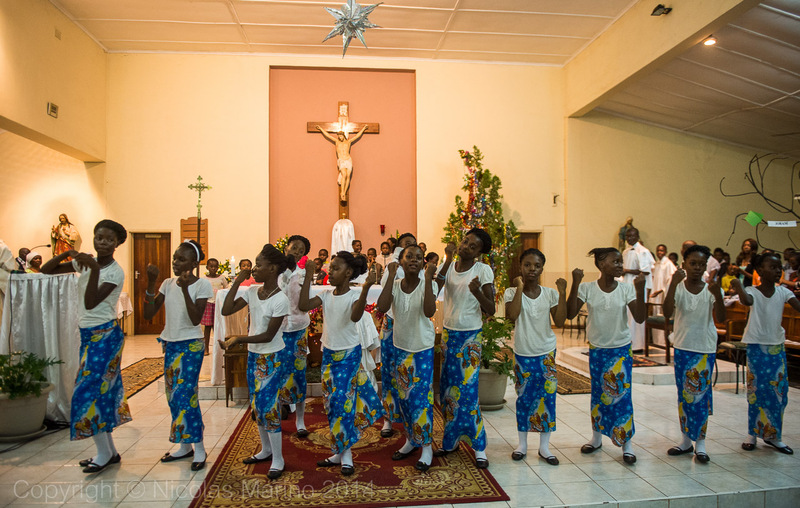 The joyful dance, the music without flats, the effusive singing; regardless of the religion, in Africa you can feel the soul filled with positive energy. For a moment, I find peace in the spiritual unity of Christians. I've never believed in any creator or Almighty God but as I look at these people, so connected facing Jesus in the cross, I fantasize about the idea having this ability they apparently have,... to get . ? .. the answers to our problems from this imaginary being, who or them is so real. Before midnight comes John and we eat together while I enjoy listening with the attention of a child to each and every life story he tells me. Thanks to his company, I spent the best of the worst possible Christmas. His friendship and affection were the best gifts that Santa Claus could have brought me in this dreadful end of the year. Now I just need to find one more place with nice company, to wait for the arrival of the New year to come. 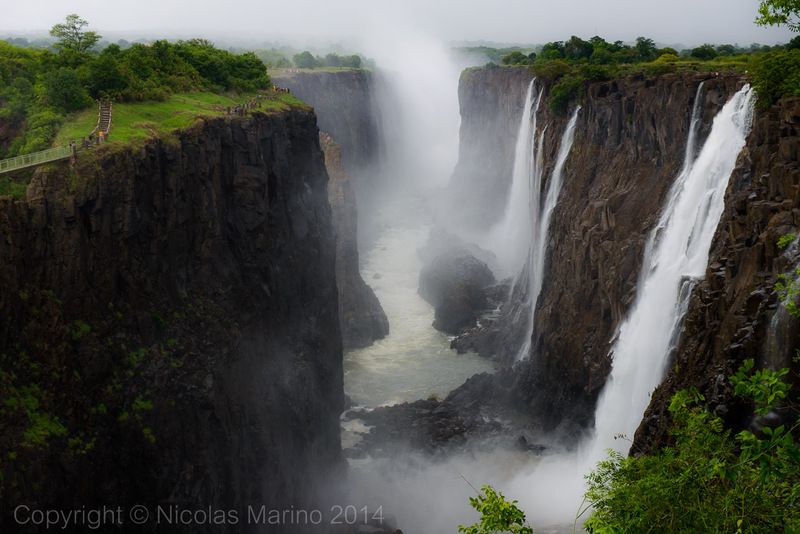 Finally, before leaving for the border with Botswana, I stop by Victoria Falls, whose majesty made me drop my jaw, and this is no small thing for those of us who come from the country of Iguazú Falls. This huge groove in the land up to 108 meters deep where the Zambezi River Falls is unimaginable, you have to be there to understand. No photo can capture the vastness of this place, is too impressive to reflect on an image. In Zambia, a sharp pain in my life arrived, and it was an ugly turning point in this journey, one that I do not desire, that I reject and I refuse. In Zambia I suffered horribly and with that same pain it is that I leave the country; but I cannot blame Zambia for what we, stupid humans, do. I loved Zambia, and Zambians in particular. I do not know what I would have become without the affection I received, they took care of me as one of them. 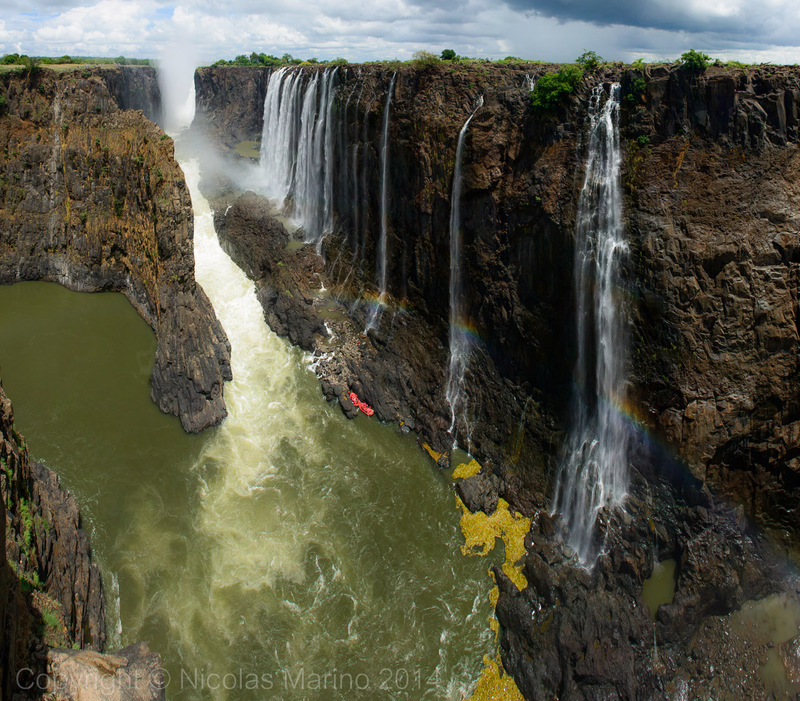 It is not the most diverse country in the world, the monotony of the bush is eventually boring, it is true, but you just need to go out on the balcony of Victoria Falls to make all that previous boredom worth it, a view of the falls is worth 1000 km of tedium. 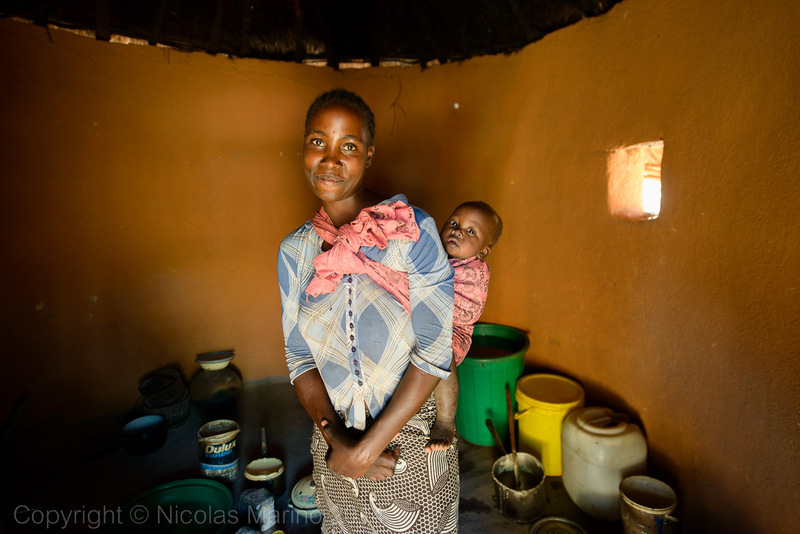 I do not know if I'll come back to Zambia, but I know that if I return, it will be a place where I can certainly feel very comfortable; on the other hand I also hope that Zambia can also be lucky enough to see the bright and shiny Nico, the one who used to be next to his iron maiden. Zambia's secrets are hidden .... and it takes time to find them because there are few roads to them.... but when you do find them it's incredible. I lived there for a decade and I explored extensively. 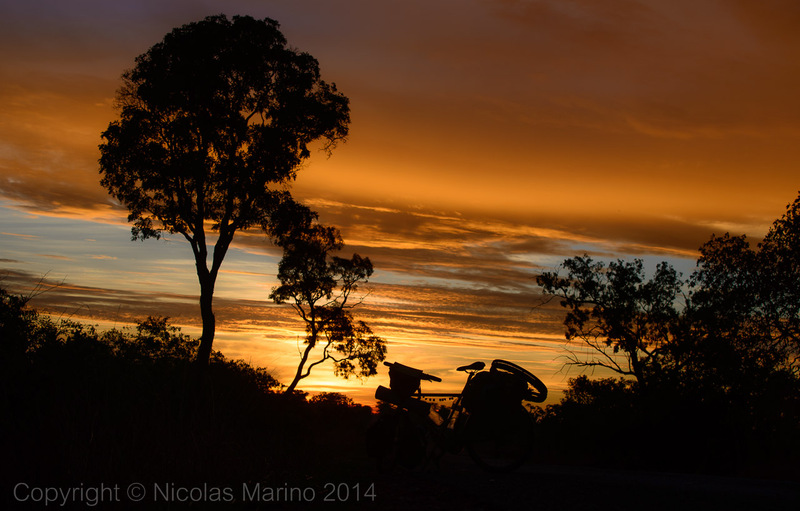 The beauty of exploring Zambia is that you are alone in your explorations and are not surrounded by tourists. The indigenous people are not corrupted by tourists and they are mostly respectful and welcoming, as you found. A future destination for you, Nico.... when you are not suffering from such a loss.